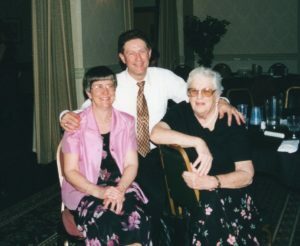 Thelma with the Farquharsons at the 75 Anniversary in 2001. It was once stated that a person is not judged by his or her accomplishments, but what they give back to society, to the world, to others. Thelma fits that description to a “t.” Throughout her life whether as a nurse, her involvement with community theater or just someone’s friend, Thelma left her imprint on many peoples Lives. I remember many years ago I drove Thelma to Cobleskill (her birthplace). She showed me the house that she was raised in. A humble home and she spoke of her childhood with pride. Though of modest means, Thelma spoke lovingly of her parents–especially her father Francis. She spoke of childhood trips with her dad to Proctor’s and how families managed through hard times. What could be seen, were the seeds of a great woman being born. She spoke of her father and mother with admiration. Thelma was raised in an era that valued simple pleasures, values that were never forgotten. An atmosphere; where simple and basic traits of human dignity, respect, and appreciation for God and life were planted. I can still remember Thelma’s mother Muriel. Even at an elderly age, Thelma’s mother would walk/make the trip from Dean Street to Union Street. She owned that street, bravely defying the laws of aging. Yes, human independence–a trait that Thelma inherited. For example, even though slowed by illness, Thelma still attended our productions and the annual meeting. SLOC’s annual meeting–the single event that Thelma most wanted to go to. Thelma was a devoted mother to Leslie and Connie, and she adored her grandson Jacob. Her fondness of her dog Molly and her cats Tuffy, Emme, and Midge were unparalleled. But what was truly unique was her relationship and friendship with Bert. A special young woman, whose destiny seemed to be intertwined with Thelma’s. At show openings Bert would be at Thelma’s side–both seated in the first row. The patience and understanding that Thelma displayed with Bert, and the love and affection they shared towards one another, which gleamed forth was truly remarkable. When I went to Thelma’s Church (the United Methodist Church on Brandywine Ave) for the funeral service, I thought to myself, “How is Bert going to take/react to Thelma’s death?” Bert was all smiles. She knew that Thelma is now in a safe and wonderful place, and that their friendship would endure. That is what is great about community theatre, not the relationships that occur during the run of a production, but the bonds that are formed outside the opera house. Donna, you’re Bert’s best friend now. Thelma is counting on you! Thelma’s first assignment with SLOC was set décor for West Side story (1969), painting bricks! Her first producing assignment was Fiorello(1971). She appreciated that such a wonderful opportunity had presented itself to her, and she was willing to share such opportunities with others. Sharing such an opportunity by asking Vince Bonafede to be Fiorello’smusical director. This show marked Vince’s first appearance with SLOC. Vince spoke to me about this incident with sincere gratefulness. Thelma appreciated and wanted to have others experience the joy of participating in a SLOC production. My first on stage appearance with SLOC was in the 1983 production of Music Man. Thelma as producer was the one who made that call, “Alan, would like to join the cast?” That moment changed my life. That is the power of community theatre, a fact that Thelma understood. 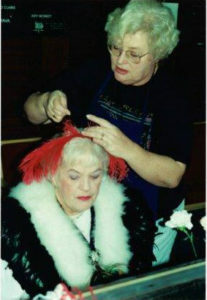 Thelma’s theatrical credits included producing shows for Schenectady Light Opera Company, Schenectady Civic Players, and Theatrical Services Unlimited. When it came to Schenectady Light Opera Company, Thelma knew the company and how to administrate an artistic entity like the back of her hand. Thelma worked backstage, produced shows, served as a Board Member and as President for 4&1/2 terms. Thelma also chaired committees including Play Selection Committee and co-chaired the Long Range Planning Committee. Thelma also served in the positions of Secretary, VP Company Operations, and VP Artistic Operations. On a personal level, Thelma was one of my closet friends that I have ever had in my life. She wasn’t just a friend down at the opera hose, but when we got together, whether for a movie, dinner, breakfast (she loved those big corn muffins at the Tops Diner in Rotterdam), or just a simple chat on the phone, her friendship was special. Her invitations to visit her camp were a delight. I told Thelma personal secrets that I never, ever told anyone else. Thelma was a fantastic listener and a source of great advice. People have spoken to me personally about my loss. Thank you! SLOC has lost many great members over the past few years. Just to name a few: Ira Gilman, Larry and Chris Pedersen, Allan Foster, Frank Paparella, and Dale Atwell. Each individual is unique in fulfilling their role to the SLOC community, its history, and artistic excellence. It is our duty to see that their memory lives on. Every time a boiler or another piece of opera house property is maintained Larry lives. Every time clerical work is done Chris lives on. Every time a soloist steps into the spotlight Allan Foster and Ira Gilman speak to us. Every time a chorus member steps forward from the third row to deliver a line Dale lives, and every single time a show is produced Thelma Zeh lives. We will not fail them.